This is a one pitch route that climbs a good crack in the back of a low-angle dihedral. It is just to the left of The Unsaid and is a great warm-up for any climbs in the area. The climbing is fun on positive holds and is always well protected. There is a second pitch. 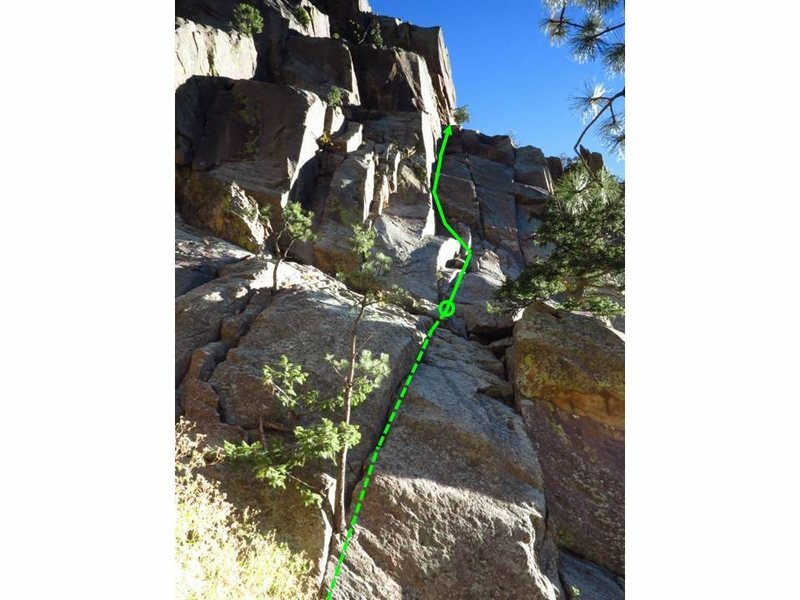 Per Dave Holliday: Steve Levin describes a second pitch to this route (5.2). After getting to the anchor atop the first pitch, clamber over some choss to access a low-angle slab. Climb it with periodic gear placements in the corner to a cable anchor with rappel rings. Standard trad rack. Bolt anchors at the top allow for top-roping subsequent ascents. Eds. The anchor may be a rope stretcher to rappel with a short downclimb with a 50m rope to the ledge 30 ft up. Consider 2 ropes or a 60m rope. Also, if you belay from the ground, do not lower with a single rope! The final high stepping move. Eric makes his way up Washington Irving. Nick Thompson stemming out 1/2 way up. Moving over the crux move on the route. Super fun route with some committing moves for a 5.6, but as said before the route eats the pro up and is a touch harder than Calypso for the same grade. Great route for new trad leaders but one suggestion: be very aware of what you are placing gear into. There is a section approximately half way up that has some very loose blocks and hollow flakes. It is easy to place gear in this section but just as easy to pull it out! In the second edition of Steve Levin's excellent guide to the canyon, he describes a second pitch to this route (5.2). After getting to the anchor atop the first pitch, clamber over some choss to access a low-angle slab. Climb it with periodic gear placements in the corner to a cable anchor with rappel rings. Climbed with Andrew on 2014/10/25. Fantastic weather (even hot for October, above 80 F), so we went climbing in Eldorado Canyon State Park. We started with Washington Irving on the West Ridge and then East Slabs on the Whale's Tail. Washington Irving: cross the stream at the parking lots south of the West Ridge. Follow up the climber's trail to about 1/2 way along the ridge to near the Long John Wall. Washington Irving follows the dihedral to the tree right of the taller routes (Long John, Break on Through, etc.). The 1st pitch of the climb might be made from the bottom using a 60m rope. A shorter 2nd pitch may be made by following the flat, low angle rock directly above the 1st pitch. There is a wire with rings to rappel from the top of the 2nd pitch. There are 2 bolts to rappel the first pitch - it will not go all the way to base of the rock with a 60 m rope. So I've marked the end of the rappel with a circle at N39.93134 W105.28788 at 6,316'. East Slabs: you can get to the top in 2 pitches if you push if and set up a less comfortable station above the big juniper tree 1/3 of the way up the rock. We rappelled off of a tree near top, maybe a 50' rappel. In retrospect, you can walk off if you downclimb a little lower on the north end or rappel the bolts at the West Crack at the top (looks like a 60 m rope or two ropes is recommended from there). Photo from the base of the East slabs at N39.93140 W105.28309 at 6,027'. I have climbed this before and always thought the standard "approach" climb to the tree at the bottom of P1 detracted from the quality of the climb. Today, we climbed the bottom half of P1 of Strawberry Shortcut up to the tree to get to the start of P1. This was a much more enjoyable approach and is consistent with the 5.6 grade for the traditional P1.